On the strength of their BBQ sauces, meat sauces and rub, Rufus Teague has developed a reputation for excellence. Everything from the packaging to the ingredient list reflects their commitment to quality. Ever since giving their Touch o' Heat BBQ sauce the highest possible rating, I've been looking forward to reviewing their other products. I finally had the occasion to open a bottle of Rufus Teague's Meat Sauce. Designed with steak in mind, Rufus Teague also recommends using his Meat Sauce on pretty much any meat you've got in your freezer. Whether you brush it on grilled chicken and chops or use it as a dip for your favorite cut of beef or wild game, Rufus Teague's Meat Sauce provides a bold, lip smacking finish. 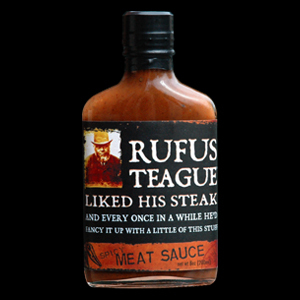 The Meat Sauce, like other Rufus Teague products, is packaged in a stylish flask. It's also slapped with their signature black label featuring a portrait of Rufus. As I've said before, Rufus Teague's packaging ranks among the best I've seen. The sauce is lighter in color than most steak sauces. It's a thin sauce, but the texture isn't entirely smooth. There are small chunks here and there. Being a thin sauce, it pours quickly from the flask. Rufus Teague's Meat Sauce comes in original and spicy recipes. Both are unique blends of bold flavors. They start with a vinegar base and add raisin paste, mustard, tomato paste and a heap of other great, natural flavors. The spicy version boasts chipotle and habanero peppers. I first used Rufus Teague's meat sauce on a cheese steak sub. 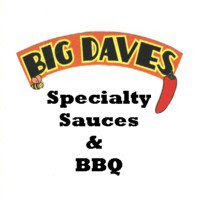 I was so impressed with the sauce's bold, tangy flavor. It's exactly how a good steak sauce should be. With or without the added heat, Rufus Teague's Meat Sauce gives beef a great kick. I don't tend to use steak sauce on high end cuts, but this sauce would be excellent on burgers and wild game. To learn more about Rufus Teague's products, click the title of this review. See how their Meat Sauce rates on the "Product Reviews" page. 0 Response to "Rufus Teague Meat Sauce"